Too few ringers, in some cases due to Halloween commitments. The count kept dropping as the day approached, and on Tuesday when it went below four, our usual minimum, practice was cancelled. The 2’s rope boss and several others have worked loose over the past seven months. It’s not clear yet why; perhaps some of the mounting holes are eccentric, like the 6’s were found to be, or perhaps there is some other reason. Time was short and the bells needed to be ringable at practice this evening, so we simply pushed the anchors back into place and tightened the screws. They will need to be examined at length in the near future. Six ringers: Barbara, Eoin, Jim, Judy, Marguerite, Thomas. Ringers were delayed due to the extensive flooding in Miami Beach, the surprise road and exit closures on 395, and other causes, and ringing began at about 9:30am. The air conditioning was working, unlike yesterday. We raised 123456. Rounds on Five, then on Six once the sixth ringer arrived. We stood every so often to rotate one ringer to the right, then we rearranged for the final ten-minute flourish. Rang down in grand cacophony. Five ringers: Anne, Jody, Nancy, Pamela, Thomas. Anne, Nancy, and Thomas raised all eight. We rang on the middle four, then the heavy five, then the light five, standing and rotating one bell to the right every five to ten minutes. The band benefits from extended practices like this two-hour session. The air conditioning was not working, apparently because the circuit for the thermostat had been disconnected temporarily for the ongoing electrical work. Fortunately it was a beautiful cool day with strong winds, and the tower windows open. Rounds and Call Changes on the middle four (3456). To move out a place toward the back, give the backstroke a little extra oomph so the bell swings a little higher and the handstroke is delayed a little. To move in a place toward the front, give the backstroke a gentler pull so the bell swings a little lower and the handstroke occurs a little sooner. 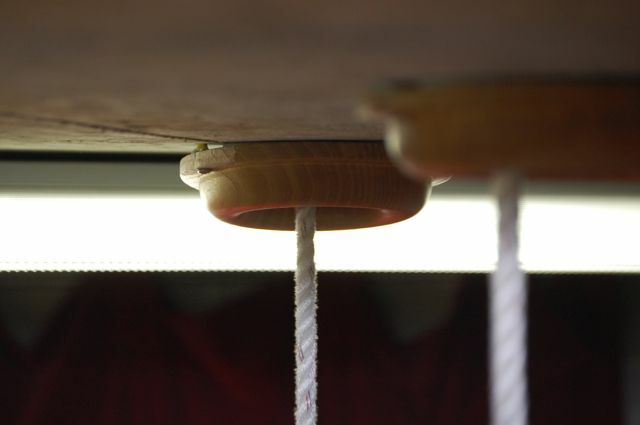 It works for any weight of bell but is particularly important for the heavier bells, which are too massive to be manhandled like the light bells, and are going to ring at the moment your previous pull set them up for, no matter what you do later. Rounds and Call Changes on the light five (12345). Jody called a few changes. Each call is shouted out during the handstroke pause, so the ringers can hear it clearly; this is also when the bell in leads starts its pull. Each call has to be called or even shouted out clearly, as otherwise, with all the echoes and reverberations, the ringers may not all hear and understand it. 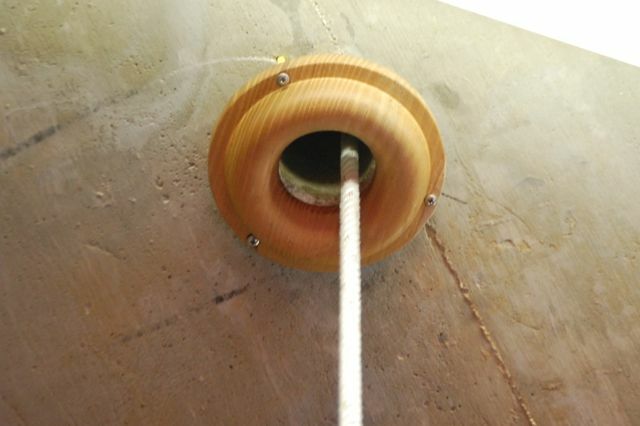 A strip of wood ply from the 7’s rope guide upstairs in the intermediate chamber, water-loosened in the days when the band left the bells mouth-up routinely and they filled with water then dumped it when the bells were pulled off, came down while Anne was ringing. After the practice Thomas went up to the intermediate chamber and pulled out several loose pieces. Two more long strips remain flapping but can’t be pulled out because they are too firmly connected, down out of reach in the box. Both Pamela and Thomas noticed something odd about the feel of the treble during the practice. After the bells were lowered Thomas went up to the bell chamber and checked it carefully without finding anything. We’ll keep an eye on the treble. Five ringers: Anne, Jody, Judy, Marguerite, Thomas. No Early Practice tonight; no ringers for it. We raised 12345. About every ten minutes we stood, rotated to the right one bell, and began again. Several people acted as temporary ringing master, something we should encourage over the coming months. Call Changes, to Queens and to Back Rounds. We had some problems with our striking, even when ringing in rounds, and sometimes the ringers involved did not realize they were not striking accurately. Here are some suggestions that have worked for other ringers. These may seem impossible at first but become easier with practice. “Count the compass” (a.k.a. “count”) while you ring. This means keeping a steady, rhythmically-even count going in your head, synchronized with the sounds of the bells not the motions of their ropes. You count “1” when the bell in leads strikes, not when its ringer pulls. Then if you think you are in nths listen to make sure your bell is striking when you say “n“, and if it isn’t then pull a little sooner/later/gentler/harder until it is striking accurately. Counting the compass will also help you internalize when to pull in order to make your bell strike at a particular moment in the future — an incredibly useful skill. Hear your bell. If you aren’t sure which note your bell is sounding, ask the conductor if you may pull a stroke or two while everyone else is standing, so you can hear it and remember it. You might want to try to sing the note to yourself, if that’s something you can do, to help remember it. Listen for whether two bells are striking too closely. Rather than the bells sounding like the steps of someone striding along evenly, if two bells are too close together it will sound like someone stumbling or tripping. Whenever a band is striking unevenly, there will be at least two bells striking too closely together (otherwise all the bells would be the same interval apart and the band would be striking evenly). If you hear two bells stumbling together, try to figure out whether one of them is yours, and if so fix it by ringing a little closer (if you are the first of the two stumblers) or wider (if you are the second one). Watch the ropes as they come down at each stroke, and try to place your pull in that sequence. This is not as accurate as listening, and it does not account for odd-struck bells, but if you can’t reliably hear what’s going on then watching the ropes is better than just hoping and pulling. Remember: if you are feeling confused, pull right now. More often than not it’s the right thing to do, particularly for new ringers. A confused ringer usually wants to stand and think for a moment before ringing, and by the time [s]he has finished thinking everyone else has already pulled and the conductor is probably thinking about calling “Stand”. So just pull; figure it out later. Back-lead trouble. Sometimes the bell in leads drifted so early that it was ringing before the bell at the back. Other times the bell in leads waited so long that the other bells swung down before it. In either case there’s the risk that the ringer in leads will correct in the wrong direction and get onto the wrong stroke. It’s only about 1½ seconds per stroke, so if the leader drifts early or late as much as ¾s — which isn’t very long — it can be almost impossible for him/her to tell which way to go to correct it. Several times ringers in leads got confused and rang ¾s late or even later. Handstroke-pause trouble. When present, the handstroke pause (and backstroke without a pause) that the bell in leads leaves helps everyone else synchronize. Whenever the handstroke pause is missing, and particularly when the leader leaves a backstroke pause in addition to or instead of a handstroke pause, there is the risk that someone or everyone will be thrown off. One ringer getting lost after a call. This happened most frequently when a ringer didn’t know who was two-ahead, and then was named second in a call and had to move in toward the front without knowing which bell to follow. In that case, the band can end up with two bells trying to follow the same bell. In a confident, solidly-striking band this can be dealt with, but we often aren’t solid enough. Suggestion: work on call changes at home using the practice program so less thinking is required when you have a rope in your hands. Uneven striking. Our striking in rounds is often pretty good, but sometimes is uneven in rounds and is usually uneven in other sequences. When the band has been called into another sequence, uneven striking can be unnerving to the ringer(s) responsible and to everyone else too. It’s easy to go from being unnerved to forgetting what you’re doing and then trying to make what you think is a correction but in fact is putting you into the wrong place; then the band can fall apart. I think it’s basically an issue of our striking not being good enough, plus occasionally a ringer getting lost. These are fixable, and we’ve been working on them and will continue to work on them. The spiral steps have been rattling as we climb up and down. I located the source of the rattling: one of the banisters near the top had lost its plastic bushing, so whenever the step shook the metal banister rattled against the metal step it was inserted into (top photo). I took off the banister, wrapped the end with a strip of duct tape (middle photo), and reinstalled it (bottom photo); no rattles. Three new ringers: Carroll, Lynn, Nancy. Nancy worked on her own on raising and lowering. Carroll and Nancy alternated, 15 minutes at a time. Seventh class this time round for Carroll. She rings both strokes together reliably, but can’t set reliably yet. Her motion is much faster at the bottom of each stroke. Kudos to Carroll for weeks of hard work on this — it has paid off. As a result, when her bell rings down she can send it back up to the balance with a single backstroke. She often (though still not always) makes a quick pickup after her handstroke, before her hands have reached the bottom of the stroke. She tends to throw out at waist level on both strokes. Not sure what is causing this. Her left hand still hangs on to the tail with her last two fingers, rather than with the crook of her thumb. She is making slow progress towards fixing this. When pulling off (though not on handstrokes), she still slides down the sally rather than grasping it firmly then releasing. She needs to work on setting the bell, and reach the point of setting five times in a row, then ten times in a row. She often forgets to follow through on the backstroke before her catch. She tends to keep her arms straight during her handstroke in a chopping motion, rather than pulling the sally vertically. As a consequence, when she releases the sally her hands don’t come clear of it. She fumbles her pickup, the bight of the rope is all over the place, and it rises in a bundle rather than in a straight line. When prompted (“follow through — elbows bent — follow through”) she does fairly well.